We’re off to ancient Egypt to learn about the mighty force of a river and meet the men and women who learned to tame her. What do you know about ancient Egypt? Powerful kings ruled over a people in Egypt for thousands of years. What force of nature was important to ancient Egyptian civilization? The water of the Nile River was important. What do you know about the Nile? The Nile is thought to be the longest river in the world. Today, it’s resources are shared by eleven countries, including Egypt. In the ancient Egyptian language, the Nile was called iteru, meaning “River.” Annual flooding of the Nile was vital to the survival of the ancient Egyptians. How so? The Nile flowed through regions in Egypt that were almost entirely desert. Drought and famine were real concerns, so the ancient Egyptians learned how to control the Nile through irrigation and by fertilizing their crops with the silt from the annual flooding. What is silt? Silt is sediment suspended in stagnant water or carried by moving water that accumulates on the bottom of rivers. It is rich in nutrients. By using the silt deposits to make the surrounding land fertile, the ancient Egyptians were able to grow crops such as wheat (used to make flour), barely (used to make beer), and flax (used to make linen). Look closely. What is this? It is a model of a much larger boat the ancient Egyptians might have used to travel along the Nile River. It is nearly four thousand years old. It was found in a mummy’s tomb. 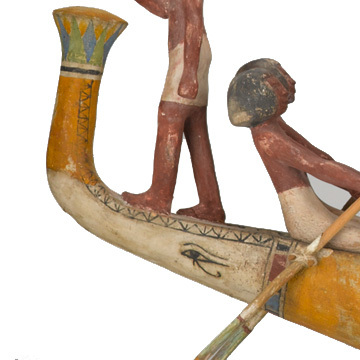 Why would the ancient Egyptians put a model of a boat in a mummy’s tomb? The ancient Egyptians believed in the afterlife. 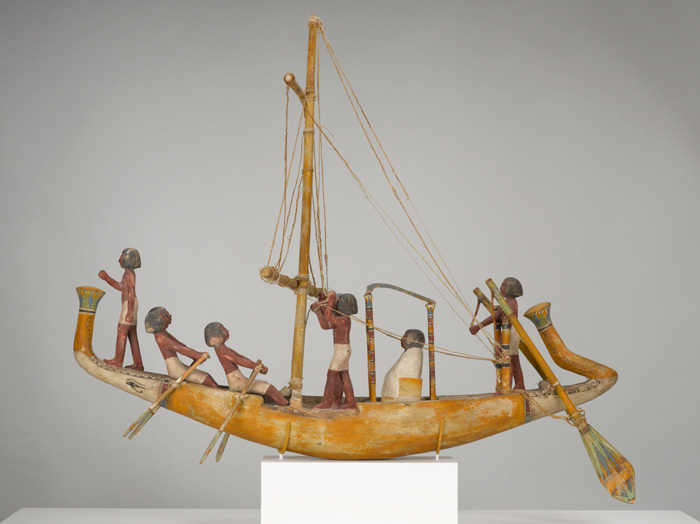 They believed a boat such as this model would provide their soul with a means with which to travel up and down the Nile for all eternity. Describe this model of a boat. It has a round bottom and is made of wood. It is carved and decorated to look like it is made of dried papyri. Notice how the finials (the tips of the boat at either end) are painted with papyri, and how the round bottom is yellow in color to represent dry papyri. Fresh, green papyri are tall, reed-like water plants that at one time were abundant in the Nile region of Egypt. Real-life papyri-form boats, probably made of wood, were used to carry mummies to cemeteries on the west bank of the Nile and for pilgrimages to religious sites. What type of energy would the ancient Egyptians use to power their boats up and down the Nile? They would use sails to power boats with the wind and oars to power boats against the wind. Does this model have both sails and oars? Yes, originally it was propelled by a sail (now missing) and attended by two sailors and four rowers. It is steered at the stern (back) by a helmsman with two oars. At the prow (front) a pilot surveys the river ahead. A man in white is sitting under a canopy. He represents the ancient Egyptian, whose mummified body was buried in the tomb along with this model. Do you see anything unusual painted on the side of the boat? There is an eye! What does the eye represent? It represents the eye of Horus. Horus is one of the ancient Egyptian sky gods. The eye of Horus seems mysterious to you and me, but it recalls a tale of a battle of life and death. In ancient Egyptian myth, Horus’ uncle Seth murders his own brother Osiris. Horus fights his uncle Seth to avenge his father’s death and to gain control of ancient Egypt, and he loses an eye in battle. Horus recovers his eye with the help of the god Thoth and presents it to his father Osiris, thereby helping Osiris to rule the underworld and achieve everlasting life! For the ancient Egyptians, the eye of Horus was a powerful symbol. By painting the eye of Horus on tomb objects, the ancient Egyptians believed they would be protected in the afterlife. The Nile River was important to the survival of the ancient Egyptians and determined many of their practices. For instance, the ancient Egyptian calendar was based on the three seasons of the Nile. The first season started in June and was the time of the New Year when the Nile flooded. The second season was the planting and growing season. The last season was the harvest season. The survival of men and women depended on water from the Nile, but animals depended on the water from the Nile too. For example, domesticated animals, such as the oxen that plowed the fields and the camels that carried the goods, depended on water from the Nile. You may be interested to learn that each year in conjunction with the annual flooding of the Nile, tadpoles would turn into frogs and the young frogs would emerge from the fertile mud. For this reason, frogs became symbols of children and new life in ancient Egypt. Indeed, their goddess of childbirth, Heqet, was portrayed as a frog or a woman with the head of a frog. Understandably, ancient Egyptian women would wear amulets of Heqet as protection during childbirth. In this way, they honored the life-giving forces of the Nile and celebrated their continual survival. Would you like to see the Model of a Boat in person? All you have to do is visit the North Carolina Museum of Art in Raleigh, North Carolina. Model of a Boat is in the ancient Egyptian galleries at the museum. Or perhaps you would like a tour. Tours of the collection are given daily, except for Monday when the museum is closed to the public. If you prefer, you can contact the museum ahead of time and arrange for you and your friends to have a private tour. I’m sure a docent at the museum would be happy to show you and your friends Model of a Boat and many other works of art. Whether you visit the museum on your own or have a tour with a docent, it will be well worth your time!